emerging choreographer she was awarded the Iris Garland Emerging Choreographer award, then she was awarded the danceWEB scholarship to train in Vienna, Austria at the ImPulsTanz Dance Festival. She received an Artist-in-Residence at The Dance Centre for the 2006-2007 where she created one of her first major works RISK, of which she was awarded the Holy Body Tattoo Emerging Artist Award. 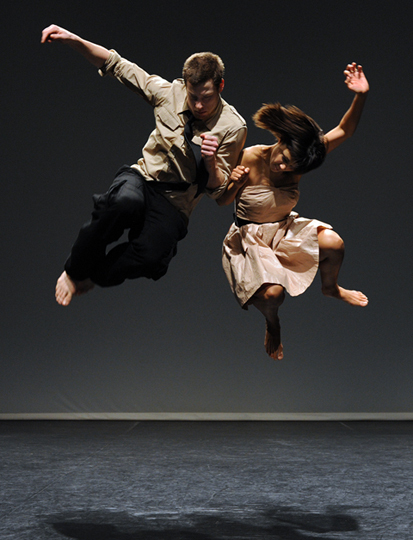 Amber Funk Barton established her contemporary dance company, the response. in December 2008. Since then she choreographed and premiered five new works, one of which she performed at the National Arts Centre. Recently I have had the great pleasure of working with Amber Funk Barton, here at Simon Fraser University as part of the repertoire course, where she has set a piece called The Weight which will be a part of Shift, the spring repertoire show at SFU. Working with her, I have seen first hand how humble and kind she is, and you can see the love and passion she has for dance. Which exemplifies who she as an artist, with everything she has done and accomplished. We gathered at a noisy coffee shop on a gloomy Wednesday, and there it began, one of the most inspiring conversations I’ve ever had. Alisa Vink: I just wanted to say thank you so much for doing his interview with me, I’m really excited to pick your brain, find out more about you and your practice of being a professional dance artist! Amber Funk Barton: It’s always an honor being asked, thank you! AV: During your years of training, you received extensive formal classical training. What made you or inspired you to make the switch and become a contemporary dancer? AFB: The biggest thing that influenced me was when I was 15, and I was taking summer school at the Banff Centre for the Arts. That was where I received my first introduction to any type of modern dance and that’s where I was introduced to the Graham technique. From my first class, I knew that this just made sense and it felt like I was coming home. It was a place where I could be myself. I realized with ballet, even though I’m still in love with it, I was always trying to be something else. I was trying to be this other perfect magical being, always comparing myself to other girls and that was not who I was. I was made for modern dance, and the Graham technique helped me realize that. During those classes, we had this amazing accompanist and pianist Tita Evidente who I will never forget. She didn’t use any sheet music and she would just play exquisitely, and paired with the Graham technique I would just forget everything in that hour and a half class. I just loved how expressive the technique was, it was very dramatic and it was filled with imagery, and even if I didn’t know what the story was, everything was a story! It just felt so natural, that’s when I realized that maybe within this there is a place for me in dance. AV: Did you always envision yourself dancing professionally? What about choreographing work? AFB: I thought I never was going to make it, I thought that it was not an option for me. I thought being a professional dancer was totally off the table and that I shouldn’t even consider it because it wasn’t going to happen. Although, I always knew I wanted to choreograph, always…always, always, always! I just thought that since I love to choreograph and being on the sidelines [with teaching dance] that if I couldn’t be a professional dancer, that’s how I will still be involved. It was when I got older and switched up my training that I started to consider that this might actually be an option, but for many years I was still thinking that this wasn’t a possibility at all, it seemed too good to be true. It got to a point where I really didn’t think of it as a career; I just concentrated solely on my training. It took me awhile to believe that I was going to be a professional dancer and all of a sudden it became an option and I started to pursue it a bit more. To this day, everything I have experienced has been the cherry on top of a sundae, with what I have been able to have and achieve. I just feel so lucky and very privileged because I didn’t even envision half of what I have been able to do. AV: What accumulated to you realizing that you actually wanted to dance professionally? Did you have a light bulb moment or was it more of an organic process? AFB: I never really had a light bulb moment, it goes back to when I switched schools and that’s where I had this teacher that would just not give up on me. She was the one that told me I could be a professional dancer, and I thought she was lying to me and I really didn’t understand. It was when I saw the way I would work in the studio and the way that different teachers and choreographers were responding to me. It got to the point where I though “What have I got to lose?” I just needed to go for it and put myself out there. I believe that you can’t just tip toe around, if you’re going to do it, just do it! You just need to jump in, rip off the Band-Aid and just go full force. It really starts to affect your focus on your training for the better. My last year of training felt very clear, I was like a horse with blinders, and I had this mindset of going out there and getting that job. It was like following a trail of breadcrumbs, that I since got this far might as well give it a try. I also had amazing parents that supported me throughout, and artistically I had some wonderful people, that to this day if it wasn’t for them, we wouldn’t be having this conversation, and I probably would have quit. AV: You have mainly trained in Vancouver but you have done work outside of Vancouver, why did you choose to stay in Vancouver and establish yourself as a professional dance artist here? AFB: It was a lot of personal and family reasons, and I also got married quite young, so I had a choice to make it work. Also, I really never had a desire to dance for any specific companies or a desire to do a big huge audition tour. I knew I wanted to stay in Vancouver and I personally knew that I needed that to make my marriage work. People could argue that maybe if I chose certain things I could have had a different career elsewhere. Although, I always did my own thing anyways, and Vancouver was a great place for me to figure out how to be a choreographer on my own, because I was completely on my own during those first couple of years. In the end, I did make a lot of choices personally but I don’t regret any decisions that I’ve made and I’m quite happy with that. Now I feel that Vancouver is one of the most creative cities to be in and to be an artist. AV: The Vancouver dance community is very small and tight-knit, how does a dancer get themselves out there? How was your journey from being an emerging dancer to an established? AFB: The biggest thing is, you can’t just wait for someone to give you a job or an opportunity. You have to be willing to create your own opportunities because no one is going to give it to you. We have small companies in Vancouver, most of which are project-based companies; most of the time choreographers will work and continue working with the people they know. No one really holds auditions; nobody has big ensemble companies here. Vancouver is a great place if you’re just doing your own thing, even though it might not be financially great, but if you get creative in how you are going to make your own pathway its great. Whereas if you want to do repertoire and ensemble work, more of an actual company feel, aside from Ballet BC there is nothing else [in Vancouver]. So if you want that experience, go to Montreal and Toronto to be a dancer in that aspect. What I had going in my favor is that I did want to create work and be a choreographer, even though I didn’t want to be known as a solo artist. I knew I needed to start somewhere and I thought that at least if I did this, I’d be seen, I’ll have something on my CV and I would have done something. You have to pay attention and create your own opportunities. Right now, it’s a different generation with the Internet being so vastly available. Even though there was the Internet when I was in my twenties, but it wasn’t the same information that you can get now. I remember I was speaking on the panel at the On the MOVE conference and everything was there, there were information tables, handouts and all of this free information. I remember that there was none of that when I was an emerging artist; I had to figure everything out. Today, information is just so readily available and accessible, there’s no reason that you cannot do anything because all the information is there, everything is handed to you. As an emerging artist you need to make sure you’re taking class and meeting people, going to dance shows and meeting people; you need to build relationships. I feel that there’s a graceful and tactful way to network without being pretentious or only talking about work. One thing I was taught by my mentors was if you like someone’s work, go tell them! What choreographer doesn’t like getting their work complemented on? And even if they don’t have job for you, it’s not always about the job. It’s about relationships and also about being connected to your community. The worst anyone can say is no. You never know, maybe they are not casting or maybe your not right or able for it this year but they will remember you down the road or maybe something will come up that you’re perfect for. Those relationships sometimes are more human, give you knowledge and create a beautiful experience rather than just a job. AV: You said that you where always interested in choreographing, but you where an established dance artist before you started to emerge as a choreographer. What began your interest in making your own work professionally? AFB: Being a choreographer definitely went on the back burner when I figured out that I could actually become a professional dancer. I focused on being a dancer for a couple of years and I was very fortunate to be super busy right after I finished my training. Then as it happens you realize that, that job is over and now there’s this lull, and you revisit what it is that drives you in the first place, which for me was choreography. I used choreography as a way to keep myself busy when I was out of work. It still wasn’t about being a choreographer; it was more about what I was interested in and how can I make some opportunities work for me. What happened naturally was this simultaneous thing, where I’d be dancing for others and trying to work on my own creation at the same time. It got to a point where the choreography totally took over, although I was still trying to balance it but it was getting really insane. Eventually I started to realize that I should start my own company. Then I had a company, and how do I balance that and am I still going to dance for other people, where the questions I had at that time. Nothing is full time, so there’s that aspect of keeping busy financially with your craft and still learning. A couple of years ago, I started working with Dana Gingras and my role as a dancer was so clear because I was doing all this work in Montreal and there I was a dancer and I didn’t have to worry about my company or creations, except for a few emails. My one job there was to be a dancer and dance for her. When I’d come back to Vancouver I’d refocus on my choreographic projects. It was very clear because there was this physical separation that allowed me to compartmentalize these two roles, which doesn’t happen all the time. Now as I’m getting older, I’m finding that I’m more confident in being an artist on my own. It’s interesting, I never thought I would understand this point in my life where the drive to perform is not the same as when I was younger. The drive to create is still there and what makes me want to go to the studio. If I couldn’t create or produce I would be like something is missing. It’s like I’m coming to terms with not performing as much or not being the dancer I was 10 years ago, and I’m okay with this because I didn’t think I was actually going to be a professional dancer. I exceeded my expectations already, there some satisfaction in that and when you have satisfaction it’s easier to let go. It’s the creation and creating of dance, that makes me want to get out of bed in the morning, it’s where I feel most purposeful. I may not be the best creator but I love it, there’s something special when I’m in the studio, where I am directing a group of dancers, leading the room, that it’s so clear, that this is what I’m supposed to be doing. It just feels very natural, just like the modern class with the light bulb moment. AV: Your dance company, the response. is a project-based company; can you give me some insight of how it is being the artistic director of your own company? AFB: It’s very challenging, being the artistic director is a totally different role than being a choreographer. It’s two separate roles, and I remember I used to think that they were the same. There is a lot more accountability to how you’re running everything and it translates to a lot of administration and paper work. I don’t mean to sounds like I’m complaining, as much work as it is, it is very satisfying at the same time. It’s a different type of work [being a project-based company]; it’s not the same as if it was a full-time company. With a lot of companies in Vancouver, if you’re the artistic director of the company, you are your company’s vision. As an artistic director, you need to make sure that what you are interested in choreography is now matching what you have set up as an organization. I feel like it’s my job as the artistic director to make sure, that as a creator, that it’s still supporting the vision of my organization. AV: How do you think your company is different than others? How is your vision different from others in the community? AFB: I do a lot of movement generation and the movement I have is quite physical. I’m not so much about the movements necessarily; it’s about the movements becoming the vessel of creating a meaning or story. I had a revelation a couple of years ago; in which I realized that, as an artist I feel like I relate more to myself as a storyteller, and dance is my medium. Dance is what I do to tell the story; it’s not always about the outside aesthetic. It’s about how does the movement feeds the idea; it is the primer of creating a place, feeling or emotion. Movement generation is a part of my choreography but there’s always an idea of what we’re going towards in making that piece. AV: In your work you have said that you aim to tell a story, how do you find that balance between the story and the dance itself? How did it play out in your latest work The Art of Stealing? AFB: It’s tricky and I feel like its something that I’m just now starting to understand and grasp, through trial and error. Looking back to when I first started, it was way too cheesy and literal. It’s about understanding the balance of shapes and images with movement. As opposed to literally acting it out, because we are not actors, we don’t have to act it out, well unless you’re hired to do that. I try to make it so that the images are the movements that are being created, and that they are broad enough that it can be interpreted in many different ways. I’ve learnt that if you literally tell an audience what they should be feeling, and if they don’t feel that, then there’s that bounce back. I feel that more people enjoy it, when they are allowed to choose what they feel. It’s almost like you want to be mysterious enough that they are always wondering what’s it about or still trying to insert themselves in to figure it out. with the two ideas and then one night I was watching The Walking Dead and I got inspired. I was watching the actors and how they did their zombie walks; they had some crazy physicality. Then I was essentially goofing around with this idea in the studio, when I realized that there was something to it and it was something that actually made sense. Sometimes if you have the idea, it manifests itself. I remember Karen Jamieson saying; if you have one little idea, you have to trust that it’s something and go with it; it’s not going to come when you want it to and that you have to be patient. That’s what I did; I just took my time and set my own time line. I was just paying attention to what I was doing and all of a sudden without realizing it; it was all on the same vain of what I was interested in. The process and creating The Art of Stealing was very intuitive. AV: Your new work, Orbits: a movement study a duet featuring you and Alexa Mardon, is showing at the Vancouver International Dance Festival is a movement research for a full-length work. What inspired you to make a work based on chemical reactions and atomic beings? to get into that headspace yet. I just want to generate movement, with the idea of space and chemical reactions, just to create a jumping off point and not even worrying about content yet. I start with Alex and the apprentices next week, so that’s really exciting. I am doing a little solo version of it at Pop Up Dances, something that I’m doing for myself. Then Alexa and I will do a longer version at the Vancouver International Dance Festival and then we’ll also do a version of that with the apprentices for the Dance Allsorts show coming up in April. It will be fun because they are no pressure situations and just doing it on my own kind of thing, which I obviously like to do. AV: You have recently gotten back into teaching again, what has that experience been like? What interested you in going back? AFB: It’s in part of needing a rest year after the big production of The Art of Stealing. I could have just jumped in into another piece, but I don’t really like starting another piece without really knowing why I’m doing it. Teaching is such a humbling experience. It’s a wonderful way to financially support yourself, while enhancing your skill set. Teaching allows me keep working on my craft and explore how can I do that teaching and creating for students. I get to play around with so many different types of dancers, and I’ve had the opportunity to figure out that how you create for a ballet dancer can be different from creating on a modern/contemporary dancer. It’s learning how to communicate with different dancers, because you can’t communicate in the same way. Essentially it just makes me a better choreographer, a better leader and a better director. AV: You are a dancer, choreographer, artistic director and teacher, what gets you through the day? AFB: I take it one day at a time or even one task at a time, like don’t even look at the whole day, just focus on that one task and put your energy to that one thing, like don’t worry about next week, just focus on the one day or the one task you have to do at that particular time. AV: Lastly, what’s next for you? AFB: This year I’m laying the ground for my solo work, which is probably scheduled to premiere in 2016. So I’m working on that and the performances associated with it such as Pop Up Dances, Dance Allsorts and Vancouver International Dance Festival. I’m really interested in teaching more. I also feel like I need to do a little bit more personal work and revisit who I am as a dancer again because I’ve been focusing more on being a creator lately. Not saying that I need to go out a dance for another company but revisiting and reassessing myself as a performer and dancer. I think I will find out even more things about myself, which will be very interesting. I also hope to be taking some time off in the summer. But in terms of what to come, it’s very much a work in progress.